Once the king of mobile phone devices, the fall of Nokia pained a lot of their fans. Their initial objection to Android, coupled with a stiff competition from Apple and Google hastened the Finland company’s sharp decline. The inability to give a tough fight to the ever-growing popularity of Android and iOS devices, at a time when smartphones were taking over the world resulted in a decision to sell the mobiles’ division to Microsoft. Microsoft, a struggling company with regards to smartphones themselves, removed the Nokia branding from the phones and replaced it with Microsoft. This marked the end of an era, a time during which the company once even accounted for nearly 4% of the total GDP of Finland. A couple of years back, Nokia Technologies announced a plan to return to smartphone manufacturing. With a few hiccups here and there, it seems that the company have finalized a strategy to approach the saturated smartphone market. 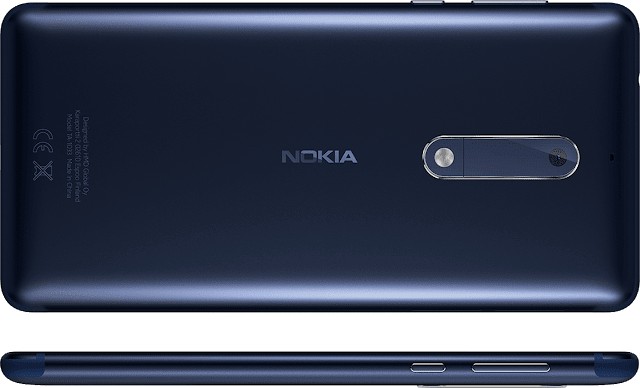 Nokia 5 will go on sale in India on 15th August, the country’s Independence Day. 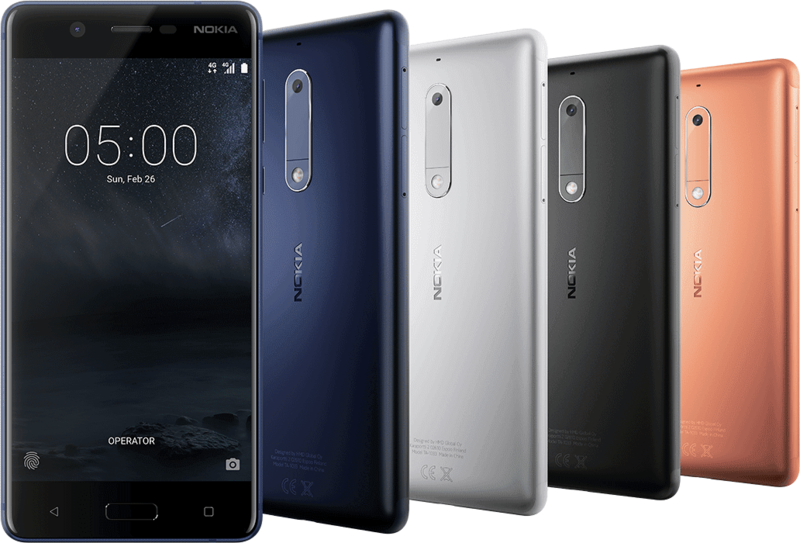 It will be available only in offline retailer shops, unlike the Nokia 6 which will be an Amazon exclusive. There are a few additional offers too, which are mentioned below. “As a result of the sophistication in smartphone functionality & services, we spend more time than ever before on our phones. People today want something that fits in the palm of their hands and they want something that will go the distance. 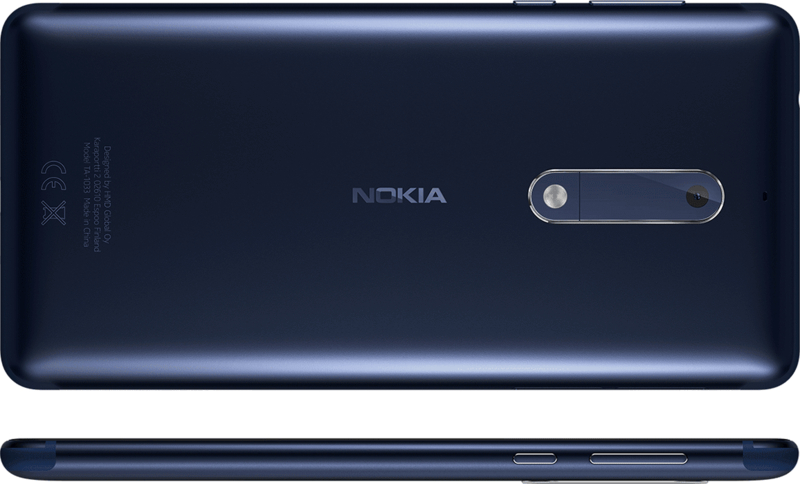 Nokia 5 is the ultimate pocketable phone at 5.2 inches with a very unique design,” says Mr. Ajey Mehta, Vice President- India, HMD Global. The phone will feature a 5.2 inch IPS display with a resolution of 1280x720. The 2.5D screen will be protected by Corning Gorilla Glass. The exterior, measuring 149.7 x 72.5 x 8.05 mm (excluding 0.5 mm camera bump), will be made out of a single block of 6000 series aluminium. The mid-ranger will be powered by Snapdragon 430 chipset. 2 GB of LPPDDR3 RAM will be accompanied by 16 GB of internal storage, which can be expanded up to 128 GB via a microSD card slot. Out of the box, Nokia 5 will be running on Android 7.1.1 Nougat. The UI will be stock Android which will help in releasing faster updates and security patches. The 3000 mAh battery is non-removable. The primary camera will sport a 13 MP phase detection auto focus sensor, with pixel size of 1.12 um, f/2 aperture and dual tone flash. Secondary camera has an 8 MP auto-focus sensor, with a similar 1.12 um pixel size, f/2 aperture and a field of view of 84 degrees. Dual SIM capabilities, Wi-Fi 802.11b/g/n, Bluetooth 4.1, microUSB 2.0, USB OTG will take care of connectivity while the sensors included are GPS/AGPS+GLONASS+BDS, FM/RDS and NFC, accelerometer, ambient light sensor, fingerprint scanner, e-compass, gyroscope and proximity. 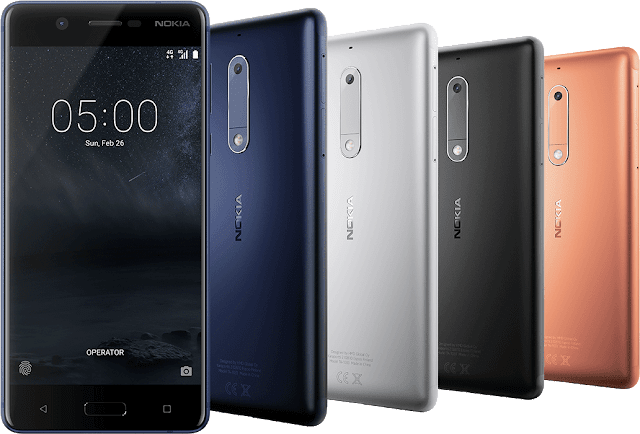 Nokia 5 will be available at retail stores across the country at a price of Rs. 12,499 from August 15, 2017. Available colors are – Matte Black, Silver, Tempered Blue and Copper. Initially, only Matte Black will be available. The other three colors - Silver, Tempered Blue and Copper - will be available in the next few weeks.